Surprise your loved ones with this graceful bouquet of peach roses, blue Hydrangea, and button chrysanthemum on their birthday or anniversary. 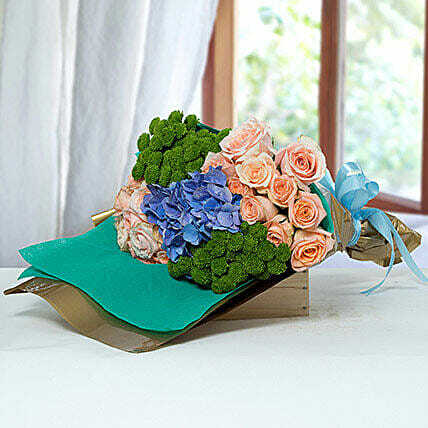 The soft, pastel shades of these flowers are the delight for eyes and will instantly lift up the mood of the recipient. One Side bunch of 20 Peach Roses, 1 Blue Hydrangea and 10 Pcs Button Chrysanthemum.